Jeep Wrangler key replacement is as easy as purchasing a factory Mopar Sentry Key with remote transmitter. This key, item #68001702AA, is designed for 2007-2010 JK Wranglers. 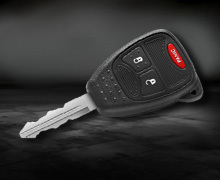 After receiving your new sentry key, you must take it to your local Jeep dealer to have them cut and program the key. The key will not work prior to cutting and programming. This key must be cut and programmed at your local Jeep dealer before the key will work.